Parish Council representatives attend the county council's HS2 Liaison Group meetings where HS2 construction issues are reviewed on a regular basis. HS2 select committee of MPs in Lower Thorpe, 2014. HS2 have provided a map indicating the ground investigation works being undertaken in autumn 2018. See the News item on 21 September 2018 on the Home page for details. HS2 monthly drop-in sessions are currently held to enable affected parishes to discuss issues with HS2 representatives. The venue, dates and times are shown in the events section on the Home page of this website. Banbury Lane may be closed for through traffic at Lower Thorpe for up to two years during the construction period. The Parish Council understands that construction of the Lower Thorpe viaduct and the cross-country haul route will probably start in 2019 and construction will take approximately 20 months. Environmental activities have already started. Construction traffic is a major concern. HS2 propose to route construction traffic along Banbury Lane through Thorpe Mandeville village to the Lower Thorpe compound throughout the anticipated two year construction period probably starting in 2019. This has created great safety and environmental concerns. 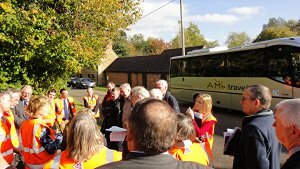 The Parish Council petitioned against the HS2 Hybrid Bill requesting noise and construction traffic mitigation. In January 2015 HS2 offered an Assurance to remove large construction traffic going through the village centre with the exception of the creation of the satellite work compound and a balancing pond in Lower Thorpe; a cross country haul route is proposed. Weekday construction traffic flow along 'Banbury Road' adjacent to the village, between Bulls Lane and the B4525 is estimated by HS2 to be circa 530 vehicles each way daily at peak time. The link below is a map produced by HS2 in 2015 showing anticipated peak traffic flows in 2021. This was issued before HS2 agreed to reduce traffic along Banbury Lane in the centre of the village. Other major concerns being considered by the HS2 Liaison Group meeting, mentioned above, are the design of power gantries and viaducts. The meeting is endeavouring to monitor and influence the position. Above: HS2 opposition sign at The Three Conies Inn, 2010, before the HS2 Bill received Royal Assent.